Whoops! Maybe you were looking for the Island from Lost? Look familiar? It should, you heathen. (Take note that this is a COLOR photo, so it's REALLY black and white. Purgatory is a nether realm colloquially referred to as “the P.O. Box of Hell”. Scenically located in Cleveland, Ohio, several annexses can also be found encroching on terra firma. The same six elevator music tracks are broadcast over and over, although at least they are randomly shuffled. Residents in Purgatory have compared being there to standing on a see-saw trying to maintain a constant balance, as any action they make could either save them or damn them. Conditions are fairly so-and-so in Purgatory. The searing fires of Hell deep below you provide a warm, comforting sensation on the ground, pleasant for ones feet and indeed for lying down on. However, this luxury is slightly compromised by the muffled screams of agony that emanate from the same source as the heat. Just one example of Purgatory's policy that anything good has to be cancelled out by something bad, and vice-versa. Purgatory is continuously illuminated by 100 Million 18 Watt single fluorescent tubular light bulbs, except for the restrooms where every fifth tube is set to flicker on and off as irregularly as possible, and the rest run at half-power. You will be answering your own phone. Not answering it is construed as a sin, and may help you get the Hell out of Purgatory. For the enjoyment of others, please listen to voicemail over your speakerphone. Replay messages as loudly and as frequently as you like. I can’t overstate this enough - Purgatory is for losers, that’s why you're here. You were too afraid of The Law to do evil, and you were too lazy to be good. And you're certainly not worthy of a secretary. 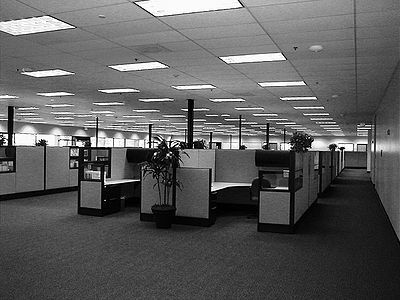 Denizens of Purgatory have access to black and white copiers, and printers. Color printers are reserved for the upper management office dwellers of Heaven. 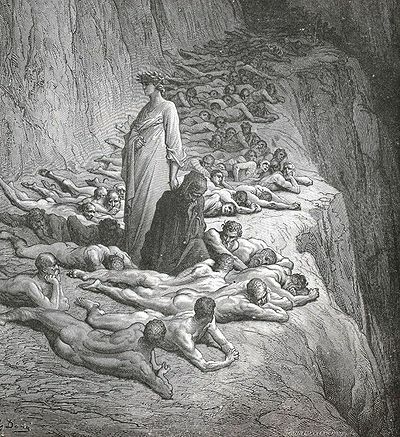 Dante tours Purgatory, entertaining folks on the road of bare asses. The Vatican has recently issued a decree that may close down purgatory for good. Many theologians have opposed the move, saying that the terminally mediocre have to go somewhere to avoid crowding the currently more selective afterlives. A spokesman from the Vatican issued the following statement; "Obviously, people are going to be uneasy with these changes, but we at The Vatican, Inc. feel that we get very good results from simply admitting that the past thousand or so years of rulings were a mistake and quite possibly made up while high, insane or clinically dead. When people start pretending that purgatory never existed, we feel the transition will be made much easier." Supporters of the move highlight The Crusades as a case of this working very well. This page was last edited on 31 August 2012, at 04:04.